Little of what was said about broadband, by government in 2013, has proved to be accurate. “I have said to NBN staff today, I’m not interested in getting information that people may think will conform to my particular political agenda – whatever they may imagine that to be. Turnbull cited figures from Cisco’s leading VNI reports – one of the world’s leading internet growth forecasts – telling the conference that the figures showed that growth of the internet was slowing. “Cisco’s first VNI index, which had been released in the middle of 2008 predicted consumer use of Internet traffic (in terms of volume) would grow at an annual rate of 49 per cent over the half-decade from 2007 to 2012 . As it happens, that prediction turned out to be extraordinarily accurate – consumer Internet volumes grew at a rate very close to Cisco’s estimate over those five years. Today, in contrast, we see that the most recent VNI, which was released in June 2013, forecasts a growth rate for total consumer use of data over the five years from 2012 to 2017 of just 23 per cent. Rather than data volumes doubling every two years, now they are doubling every four years. Turnbull is correct that the VNI forecasts have constantly proved tremendously accurate but his suggestion that growth is slowing couldn’t be further from the truth. "Global IP traffic is expected to increase fivefold from 2008 to 2013, approaching 56 exabytes per month in 2013, up from approximately 9 exabytes per month in 2008." It shows that more traffic will be crossing the internet per month in 2016 (110 exabytes) than it did for the entire of 2009 (108 exabytes). In short, actual data growth is enormous and only the percentage growth has declined. “The numbers are now so large that the "Law of Large Numbers" means that percentage rate increases might be going down but actual increases are still "dramatic." Pepper has also since noted that the VNI forecast hadn’t yet factored in the adoption of “4K” Ultra High Definition video which was now available on mobile phones like the Samsung Galaxy Note 3 and on numerous consumer-level TV sets in Harvey Norman and JB HiFi. Major video streaming service Netflix has also announced that it will start distributing its content in 4K from next year [Update: Netflix started streaming much of its home—produced content in 4K in March this year and it requires a consistent download stream of about 20Mb/s. Also, all TV manufacturers have been focusing on 4K screens since last year]. All this means that video growth, due to healthcare, business, education, communications and general entertainment, which is already the dominant source of internet traffic, is likely to soon balloon even faster. It’s already impractical to distribute regular video over copper-based internet due to the low upload speeds inherent in the technology. 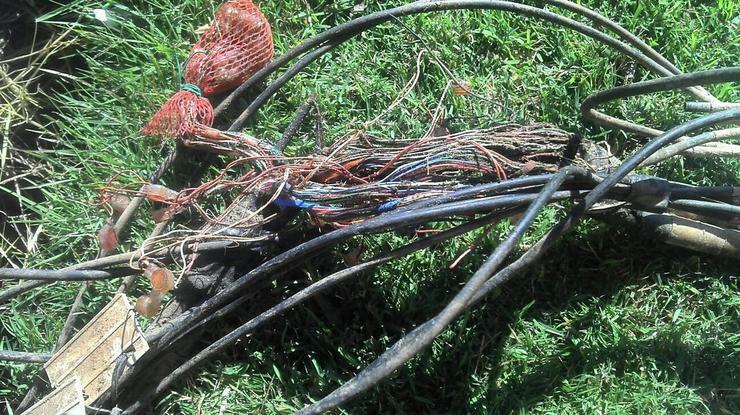 “Operating cost of the fibre network is dramatically less than the fibre network. It's really a CapEx issue. If you can get the CapEx investment to invest in the fibre network, your operating costs reduce dramatically. Your liabilities are lower, your truck rolls are fewer your electricity costs are lower. It's a CapEx question but once it's there every operator globally that has put in a Fibre to the Premises network has found its operating costs are dramatically lower. "A Zettabyte [one trillion gigabytes] of data will be travelling across the internet by 2015 - eight times more than all traffic in 2008. Globally, Internet traffic will grow 2.9-fold from 2012 to 2017, a compound annual growth rate of 24%. Globally, peak Internet traffic will grow 3.5-fold from 2012 to 2017, a compound annual growth rate of 29%. Globally, Internet traffic will reach 93.0 Exabytes per month in 2017, up from 32.2 Exabytes per month in 2012. Global Internet traffic will be 3.1 Exabytes per day in 2017, up from 1.1 Exabytes per day in 2012. Global Internet traffic in 2017 will be equivalent to 279 billion DVDs per year, 23 billion DVDs per month, or 32 million DVDs per hour. In 2017, the gigabyte equivalent of all movies ever made will cross the Internet every 4 minutes. Global Internet traffic in 2017 will be equivalent to 59x the volume of the entire Global Internet in 2005. Globally, Internet traffic will reach 12 Gigabytes per capita in 2017, up from 5 Gigabytes per capita in 2012. Globally, average Internet traffic will reach 283 Tbps in 2017, the equivalent of 235,860,000 people streaming Internet HD video simultaneously. Globally, busy hour Internet traffic will reach 865 Tbps in 2017, the equivalent of 720,490,000 people streaming Internet HD video simultaneously. In Australia, IP traffic will grow 2-fold from 2012 to 2017, a compound annual growth rate of 17%. 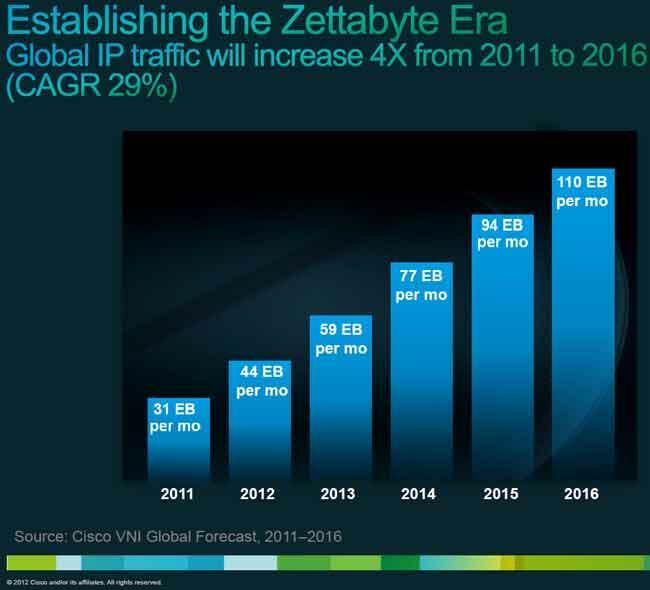 In Australia, IP traffic will reach 755 Petabytes per month in 2017, up from 343 Petabytes per month in 2012. Australia's IP networks will carry 25 Petabytes per day in 2017, up from 11 Petabytes per day in 2012. In Australia, IP traffic will reach an annual run rate of 9.1 Exabytes in 2017, up from an annual run rate of 4.1 Exabytes in 2012. Australia's IP traffic in 2017 will be equivalent to 2 billion DVDs per year, 189 million DVDs per month, or 258,430 DVDs per hour. In 2017, the gigabyte equivalent of all movies ever made will cross Australia's IP networks every 8 hours. In Australia, IP traffic will reach 30 Gigabytes per capita in 2017, up from 14 Gigabytes per capita in 2012. As such, you need to ask yourself, why has Turnbull told everyone that growth is slowing when it clearly is doing anything but?